Joe attended his local state secondary school then sixth form college in South Birmingham. His health condition sometimes interrupts his educational progress so he will be a few years older than the average graduate will be when he completes his degree course. He has always had the long-term goal of becoming a Member of Parliament but wants to have another career before this. However, when he was younger he was not clear what this might be. 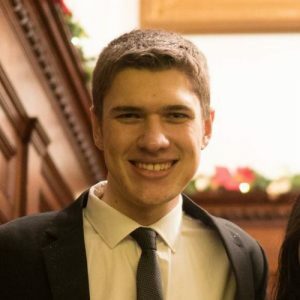 Politics is such a broad degree with so many career possibilities that he has changed his ideas several times since he came to Lancaster but he is now focusing on a managerial career and on getting a place on a corporate management graduate training scheme when he leaves university. The Careers offer was one of the reasons Joe chose to come to Lancaster. He really appreciates that there is a member of the Careers team who focusses on opportunities for disadvantaged students, sends them information and – in Joe’s case – talks through what is involved to ensure it will work for his health needs. Careers introduced Joe to the Upreach social mobility agency, which has had a very positive impact on his career planning, and search for opportunities. The range of individual career development opportunities offered and the chance to discuss his limitations with an expert in the field who could tell him that it won’t stop him achieving what he wants to achieve, has given him a great deal of confidence. He realised that the career he wants is flexible and can be done part-time. Upreach advised on the value of doing a placement to increase his chances of getting onto competitive graduate schemes and negotiated with a prestigious graduate employer for a placement around his specific interests. They helped Joe with the application and highly competitive selection process so that he was successful right up to the final stage of the selection process before having to withdraw on this occasion due to ill health. Joe thinks that the Future Leaders Experiences Programme (previously known as Frontrunner) arranged and funded by Careers is an amazing thing for students to be able to put on their CVs because it’s very difficult at their age to get a management qualification. He used it in placement cover letters and interviews as evidence of his skills. Also, the focus on people with disabilities and having a deaf course leader who was amazing at what she did, and who didn’t allow her disability to get in her way, gave him confidence in his own ability to achieve. The Careers Website has been useful for practicing psychometric tests and getting basic information on setting up a Linked In account and writing speculative covering letters. Joe also accessed 1-2-1 meetings with members of the Careers team, including very useful appointments with the Careers Consultant in his Department.